Enjoy a second day of exploring the history of the Donner Party by choosing the two day package for $80. 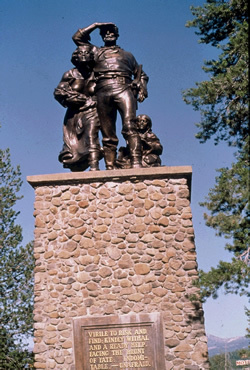 Hikers depart from 8:30–9:00 a.m. at the Donner Camp Picnic Area, located on Highway 89 approximately 8 miles north of Truckee at the Alder Creek site that is believed to be the site of the Donner family cabin. Walking tours begin promptly at 9:00 a.m. The day begins with an interpretive walk where you will hear of the grueling travel and mishaps of the Donner Party and the archeological finds at this location. Participants will then drive to Donner Memorial State Park to view the Murphy Cabin Site and Pioneer Monument. Participants are welcome to view the movie documentary and explore the Emigrant Trail Museum at the State Park, admission to the park is included for the remainder of the afternoon.